In these two BBC World Service 23 minute programmes, broadcast in 2008 and 2009, archaeologist Win Scutt plunges underwater to reveal the historical and monetary wealth that lies at the bottom at the sea. And asks the question how should we protect this treasure trove? TRANSCRIPT OF PROGRAMME 2 "The Treasure Hunters"
OPENING ANNOUNCEMENT: Time now for the second part of “What lies beneath”. Today, Win Scutt investigates how the treasures of the deep should be protected. The thrill of treasure hunting described there by Captain Mike Hatcher, the discoverer of the Nanking Cargo in the South China Seas, one of the most lucrative cargos ever found. Having made a discovery or two myself as an archaeologist, I can see why many would find such tales not only exciting but also very enticing. But as I’ll be finding out in this programme, treasure hunting has too often meant the loss of crucial historical information. And most of the archaeologists I’ve spoken to are warning that unless something is done rapidly, humanity’s underwater cultural heritage will simply disappear. Part of the problem they say is that finding a treasure is not as difficult as one would think. Lee Spence is a pioneer in underwater archaeology and he’s been studying shipwrecks and sunken treasures for nearly 50 years now. It’s been estimated that over the years, Lee Spence has salvaged over 50 million dollars in valuable artefacts. He says is only a minuscule proportion of what is out there. He believes that up to two thirds of all the gold mined before the 20th century could still be resting on the ocean floor. Mike Williams is an expert in the law relating to underwater cultural heritage. For all the excitement it provides, he says excavating a wreck for its treasure all too often happens at the cost of archaeology. A view shared by Ulrike Koschtial from UNESCO, the United Nations’ Educational, Scientific and Cultural Organisation, where she is responsible for the protection of underwater cultural heritage. One such country is South Africa, where it is believed that most of the region’s valuable shipwrecks have already been salvaged. And this hasn’t meant the looting has stopped either. Jonathan Sharfman is a local maritime archaeologist. In many ways, it is a similar situation to what happened with land archaeology in the 19th century, when there was almost no regulation; meaning cultural artefacts could easily be retrieved and sold away from their countries. Unlike its land counterpart, far from sight, far from mind, underwater cultural heritage has remained largely unprotected. But most of it was for a long in international waters, where it remained largely inaccessible. Greg Stemm is one of the co-founders of Odyssey, a deep ocean salvage company based in the United States. Last year, they discovered what is considered to be the largest treasure ever found, possibly worth 500 million dollars. However their find has proven controversial, with Spain claiming the ship is one of their sovereign vessels and accusing Odyssey of looting. The case is currently being heard in a court in Florida in the United States. Greg Stemm denies being a treasure hunter, and insists Odyssey has always followed strict archaeological guidelines. But he does agree that the problem is one of a lack of regulation. “In the next 50 years, I bet we will have completely mapped the bottom of the oceans of the world. We’ll know where every shipwreck is. We’re out there knocking several square miles per year. We’re the responsible ones. We take note of where they are, if it’s a cultural significant wreck, we leave it there. I don’t think that’s always going to happen. I think you’re going to see hobbyists out there, people trawling nets through these sites. And it’s up to us to figure a mechanism over the next 50 years to make sure that the data we can garner from them isn’t lost for ever. Well, it might be better not to know where they are in the first place. But one thing about humans they will not leave an area unexplored if they have the capacity to explore. You can count on that." You’re listening to “What Lies Beneath” from the BBC World Service, with me Win Scutt. We’ve heard how the ocean is a fantastic treasure trove, both in historical and monetary terms. But it is also a treasure trove that needs protecting. So how could we protect it? Well, one obvious argument would be to say that every single shipwreck and underwater city should be excavated and this only by archaeologists. But this could turn out to incredibly expensive… as I found out when I went to visit one of the world’s most famous wrecks. Win: It was such a big thing wasn’t it such a big thing when the whole ship was lifted out of the water? “Win: It’s weird. It’s like looking at a ghost, just an enormous ghost in the shadows. I can see a sort of great black shape in there. It starts to become clear that it is half a ship that we’re looking at. Win: But it is ghostly, because we’re kind of looking through a mist, aren’t we? 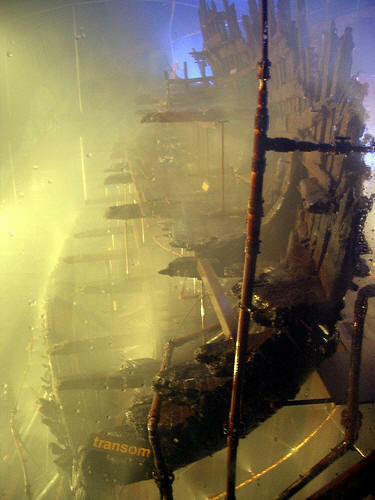 Only three timbers were visible when archaeologists first discovered the Mary Rose. Almost all the ship had remained buried under mud, in oxygen free sediments. Once taken out of the water, the wood would have simply dried out and turned to dust had it not been sprayed without interruption for the last 25 years. And this has meant spending at least another million dollars a year. Quite tellingly, there hasn’t been any other excavation in the world on a similar scale for at least a decade now. New regulations on how to use divers, stricter archaeological guidelines, and especially a better awareness of the costs involved afterwards, have meant that archaeologists think twice before raising a ship. “Really if one were to find it now and there’d only be 3 timbers exposed, one would probably at least ask the question: should we be leaving it in situ? Win: Are you really saying that if this were to be found again, say we’d never found the Mary Rose, and it was to suddenly turn up today, do you really think that it wouldn’t be excavated? A lot of archaeologists do not feel the Mary Rose was done to proper archaeology, that they shouldn’t have even used the volunteers. But if you were to do every wreck to do that standard, you’re talking about a hundred trillion dollars. There’s just no way you could ever come up with that money. 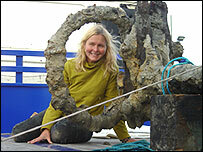 And for that reason, rather than forsaking most of the world’s shipwrecks, treasure hunter Lee Spence argues that their commercial exploitation should be allowed, as long as some archaeological guidelines are being followed. A position Greg Stemm from Odyssey agrees with. The key thing he says is to distinguish between cultural goods, which need protecting and trade goods, which can be sold. But not everyone is convinced… Ulrike Koschtial from UNESCO strongly believes that cultural artefacts, whatever their nature, should belong to all and not a few isolated individuals. Back in 2001, the organisation drafted a convention on the protection of underwater cultural heritage, the first of its kind, which should come into force by the end of 2008. But the organisation is also very much aware of the high costs involved in underwater archaeology. So as a first principle UNESCO actually recommends to leave things where they are, a concept which is referred to as preservation in situ. And UNESCO further believes that preservation in situ could also give rise to a new form of tourism, as underwater museums and dive trails are developed around the artefacts on location. There actually already is such a museum, off the coast of Israel, in Caesarea. Back in the times of Jesus, the ancient port of Caesarea was built by King Herod to honour his Roman patron, Caesar Augustus. Most of the port has since disappeared under water. But today equipped with a waterproof map, divers and snorkelers can swim along the signposts and admire the relics of this once prominent port town. An appealing experience, which I couldn’t resist trying out myself… So I took my wetsuit to Israel. “Avi: Dive time 40 to 50 metres, max depth 8 metres. OK? Win: Any hazards? Any boats? (Heavy breathing and bubbles throughout) Ready we’re going down… Thumbs down is the signal to descend. Now I can see a column in front of me, a large stone column. And another column over there. Kind of whole fragments of the city on the sea bed. It’s almost like the whole city has exploded. I’m going to have a look at the map now. Now this waterproof map gives you a trail. You’re listening to “What lies beneath”, from the BBC World Service. I was definitely convinced by my dive in Caesarea, but I’m also aware that while increasingly popular, diving does remain an expensive hobby. But there are other alternatives being explored. One being a project for Alexandria’s Harbour where the idea would be to allow visitors down into an underwater glassed structure for them to see the ancient remains of Sphinxes and other Egyptian artefacts. But not everyone shares such enthusiasm for preservation in situ. Nic Flemming is an underwater archaeologist, who specialises in prehistorically submerged landscapes. And Nic saw his concerns confirmed recently. A survey carried out in England showed that more than 40% of its historic shipwrecks are in danger of being lost forever as many have been allowed to decay. Clearly, leaving things where they are also comes with a high risk of vandalism and natural decline. But those who are apprehensive about the UNESCO convention may not need to worry quite yet… It will very likely get the 20 countries needed to ratify it, for it to come into force, but will only apply to those countries. Most of the world’s maritime powers, such as Britain, France and Russia and more importantly the one with the strongest salvage industry, the United States, are showing no intention of signing it. The reason has actually little to do with archaeology. Legal expert on underwater cultural heritage, Mike Williams. The UNESCO convention would indeed give coastal states certain rights over wrecks found in their waters. For instance, if a French vessel was to be found in Brazilian waters, Brazil would then have a duty to protect it and therefore have a say in how it should be done. So what alternatives are maritime powers considering? Doing nothing is not an option anymore. Even the most famous shipwrecks of all needs protecting… Robert Ballard, the man who discovered the RMS Titanic has been warning that the wreck has become a victim of its own fame…. Damage caused by submarines, and they’ve been landing a lot on the deck and that’s really where the damage has been done. They leave a very definitive marker and you can just see them all over the ship. And you know if you can’t protect the Titanic what, prey tell can you protect in the ocean? But such warnings have prompted a response. So instead of signing the UNESCO convention, maritime powers might prefer a series of case by case multilateral agreements between specific countries, like they did with the Titanic. And so where does this leave treasure hunters? Backanno: Mike Williams ending our second and final edition of “What Lies Beneath”, presented by Win Scutt and produced by Estelle Doyle.